Ceiling fans that feature stained glass lighting is a fun way to add a pop of color and sophistication to your home decor. Stained glass ceiling fans are a great way to turn a traditional ceiling fan into an impactful centerpiece in any room. Here we list some of our favorite stained glass ceiling fan designs available right now. River of Goods combines the beauty of stained glass art with the functionality of a ceiling fan with their Halston model. This Tiffany style ceiling fan features six lights that highlight a beautiful stained glass mosaic in the light kit and motor body. The fan features a total of 334 glass cuts with 33 gemstones inlayed in the glass for a sophisticated touch. Since every piece of glass used is unique, no two ceiling fans are exactly same. Anyone looking for a beautifully crafted ceiling fan with stained glass lights will love the elegant design of the River of Goods Halston ceiling fan. Andersonlight’s Tiffany Stained Glass Ceiling Fan is the perfect touch of vintage elegance and stained glass art. The light kit features a flower design that adds a nice pop of color to the fan’s red bronze body. The motif continues with red bronze leaves that hold the light kit in place. What we love the most are the decorative elements found throughout this ceiling fan’s design. The motor enclosure has a gorgeous relief design while the blade medallions follow with a similar decoration. This Andersonlight stained glass ceiling fan is sure to be a welcoming centerpiece in any room. 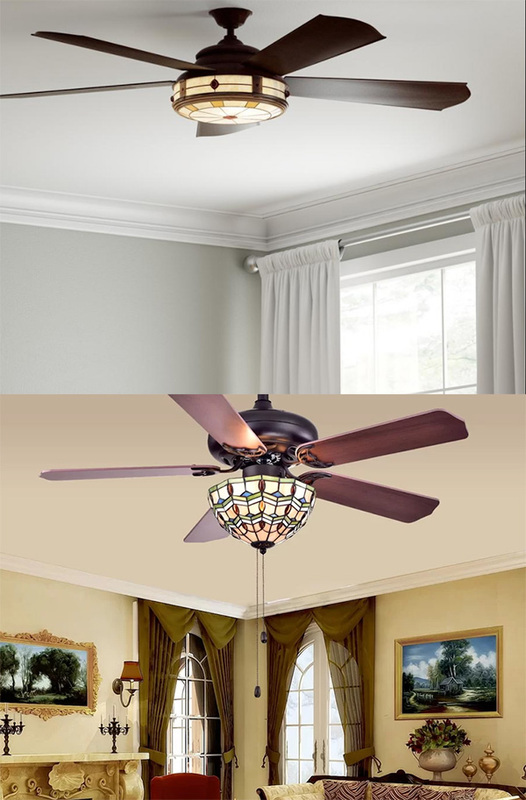 Hampton Bay offers an art deco take on Tiffany glass lighting with their Savona ceiling fan. This 52-inch ceiling fan features pan-style light kit that creatures an elegant glow through it’s rich earth-toned glass. Because of the flat shape of the light kit, this stained glass ceiling fan is great for accommodating rooms with low ceilings. The motor casing and hardware is made of a weathered bronze finish while the blades feature a mature cherry wood finish. The Hampton Bay Savona includes a remote control and is also wall control adaptable. This makes the Savona perfect for those who want to install a Tiffany style ceiling fan that is not pull chain controlled. Warehouse of Tiffany offers a traditional design with all of the charm you would expect from a stained glass ceiling fan. The Doretta features 3 lights nested inside an elegant Tiffany style bowl. Gemstones are incorporated into the symmetrical glass design for an inspiring look. While the light kit is colorful and eye-catching, the rest of the fan does a great job at offering plenty of simple lines and warm tones. The motor housing and hardware are made of a matte finish black metal while the blades offer a warm wood tone. The design is understated and does a great job at allowing the stained glass light kit to shine. Vaxcel’s French Country ceiling fan is an elegant ceiling fan that will not fail to be the centerpiece of any room. It’s chandelier-like light kit features 3 beautiful Tiffany style glass shades. The light kit arms and fan blade medallions follow an elegant leaf-shaped motif that compliments the stained glass design nicely. The ceiling fan motor housing is made of steel with a black oil-shale finish to add to the vintage look. The included fan blades are reversible, giving you the option of rosewood and walnut finishes. What we love about this ceiling fan is it’s simple yet ornate design that feels warm and inviting. Stained Glass Ceilings Fans can add color and sophistication to just about any home decor style. While some people may think that stained glass decor is better suited for traditional styled spaces, the truth is that that there is actually a huge range of stained glass styles and designs that can fit in just about any decor. Those with Mission, Arts & Crafts or Contemporary style homes can welcome the pop of color and added sophistication that a stained glass ceiling fan, lamp or window may bring to the space. For those who dare to add something different and something new to their homes, a stained glass ceiling fan will be a welcome addition that is sure to receive plenty of compliments from guests. Part of the magic of adding stained glass pieces to your home is you are bound to find the perfect style to compliment your already existing decor. Art deco and Nouveau inspired stained glass features a variety of symmetrically shaped patterns and eye-catching designs. While other Tiffany stained glass pieces often feature nature inspired motifs in rich colors. As seen with the stained glass ceiling fans featured in this list, glass motifs vary from floral designs to patterns with embedded jewels. Ceiling fans with stained glass lights can also act as an impactful centerpiece in an otherwise minimalist or contemporary room.